There's a lot of chatter on the internet lately about knitters who sew, and sewers who knit. Makers everywhere are dusting off a forgotten hobby, or learning a new skill. I'm encouraged that the lines between the two are quickly blurring. I've always incorporated a little sewing into my knits, and this is not the first mixed media outfit I have made. Not sure if I was ahead of my time, or just didn't know any better. Either way, I have persevered to the point of completing my very own interdisciplinary outfit, which has been on my mind for a long time. First, a hand knit sweater in a color I adore. 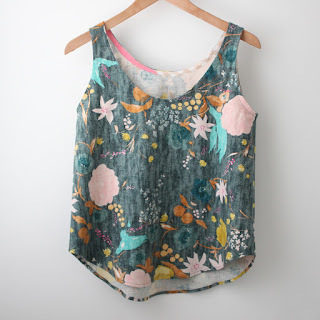 Second, a sewn tank top from one of my very favorite patterns. Third, linen trousers that are self-drafted. Let's start at the top with this snug little cardi. 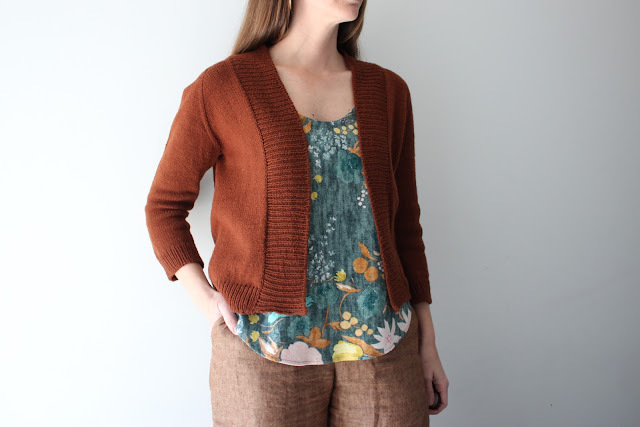 This is the Featherweight Cardigan from Hannah Fettig. I bought Hannah's book Home & Away last fall, and I've been meaning to make a Georgetown Cardigan. The Georgetown is a fairly substantial cardigan, and spring is coming, so I thought I'd make a Featherweight Cardigan as a warm up. I was beginning to feel like the last knitter on the planet not to have made one of these, and now I see why. It's so versatile. The top down construction allows you to customize the fit as you go. 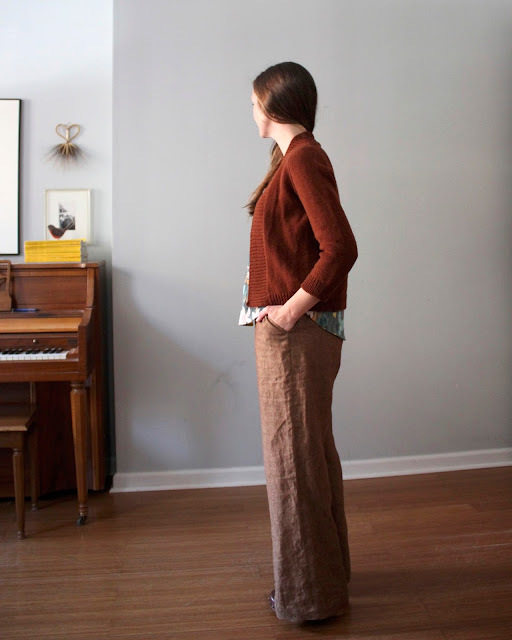 I used a ready to wear sweater as a guide for the widths and lengths. More details of the sweater alterations are in my Ravelry notes. I kept track of weekly progress on instagram (#sweetkmWIP) to keep myself motivated in the midst of all that stockinette. The yarn is Quince & Co. Finch in Gingerbread. I love the color, and thought it would go well with all the chambray in my closet. But based on these photos it goes with a whole lot more. I think this yarn is a little squishy in the gauge specified. I'd like to make a black one with the same yarn, and will probably tinker with the pattern for a tighter knit. The top is the Basics Tank from Cali Faye Collection. I love the elliptical neckline, and the curve of the hem on this design. It is the most flattering tank I've come across, so I'm just gonna keep on making it. I raised the neckline 1" and added an 1/8" to the sides for I could french the seams. 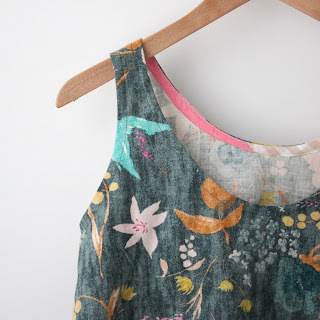 The fabric is Nani Iro from Miss Matatabi. If you've been following along on instagram you already know that I thought this was double gauze when I bought it, and it turned out to be brushed cotton. I was so busy falling in love with the gorgeous forrest and blush colorway that I didn't read the description! Believe me, the fabric type was clearly stated in the description but it was telling me things I didn't want to hear. After my initial disappointment the fabric is growing on me. It's a bit stiff for this design, but a beautiful texture and quality. I would have bought it anyway for the flawless color palette and watercolor print. The pants are self-drafted (a previous version). This is a little labor of love I've been working on for a few months off and on. I really want to sew pants, but I don't feel like fussing with the fit of a pattern that doesn't like my hip to waist ratio. I thought I might as well fuss with my own design from the start. I followed the instructions in the textbook from my pattern making class, then nipped and tucked my way to what you see here. 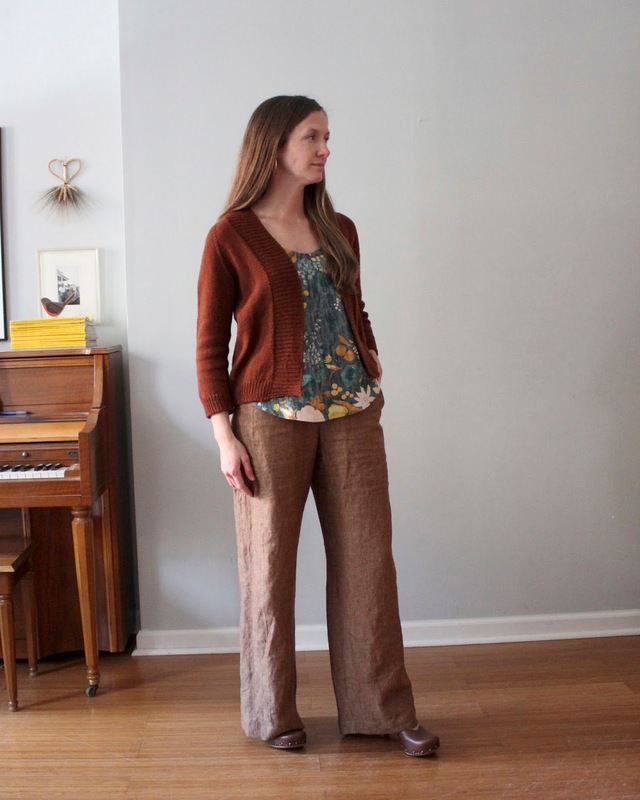 These pants are high waist, pull on, wide leg trousers with a faux fly, and the always indispensable pockets. I'm hoping they will evolve into a more structured zip fly and waistband trouser. Yarn: Finch in Gingerbread from Quince & Co.
Gorgeous! Though I was so sad to read "Trousers- Self Drafted"-- I adore the style and fit (obviously perfect because you made it just for you!). I am probably not really up to sewing pants, but these would make me give it a try. It must feel amazing to wear this- well done! Thanks Sarah! This is a good style to start with pants, they really only have to fit at the hip. I think Marilla Walker has a similar design in her Mercury Collection. Or the Demi Pants from Tessuti could work. I love everything about this! 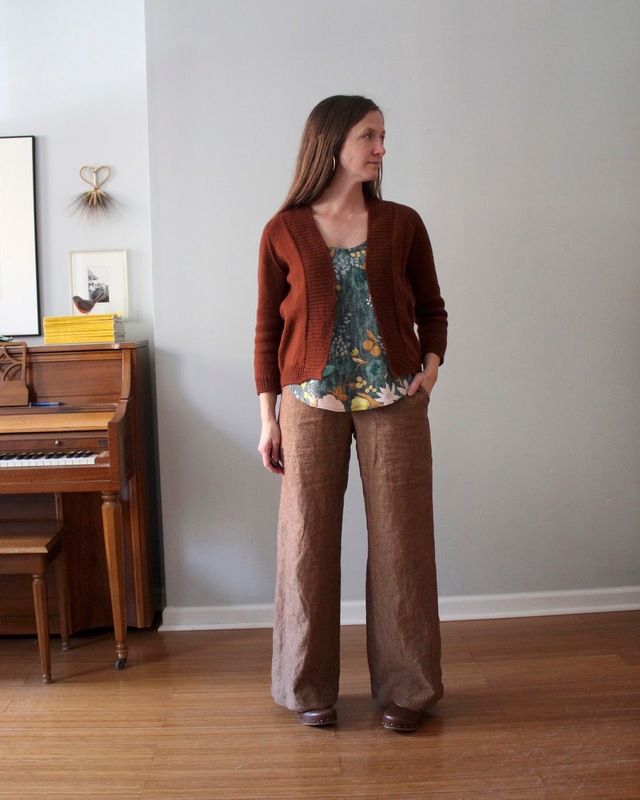 The colors, the style, and certainly that you self-drafted the pants! Learning to become a better knitter is high on my list. I absolutely love crochet, but sadly knitting doesn't come as easily to me. 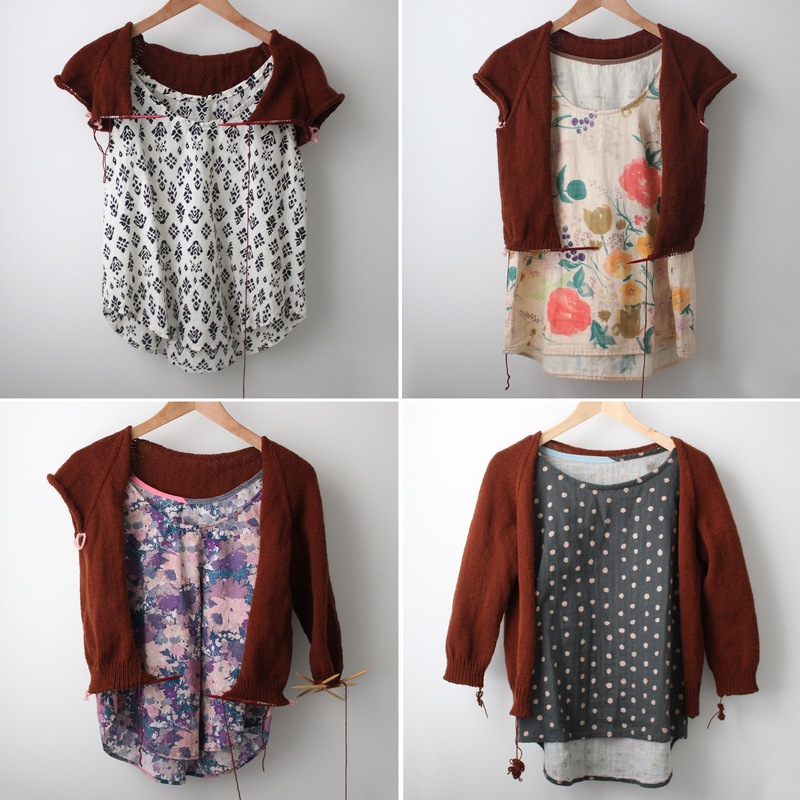 Your cardigan is gorgeous though and makes me want to try again! I am in need of a good woven tank pattern and may have to try this one out. I've made the Wiksten tank a couple times, but have had trouble with gaping at the back neckline and just haven't taken the time to adjust it to try and make it work for me. Thanks for sharing! Ah, such a lovely spring outfit! Great colors and you look so cute and comfortable! Thanks Kristin! The cardi is definitely a hit, I need some warmer weather for the rest! Trousers fit is always tricky, I think you nailed the perfect fit here. Thanks Diana! The pants were tricky, but it was fun to work them out. what a gorgeous and pulled-together outfit! Love the Nan-Iro fabric, too. you're so lucky to be taking that pattern making class. Thanks. You really can't go wrong with Nani Iro! Love the outfit. ThT gingerbread colour is my new favourite neutral. I adore my featherweight from afar but am realising it's just a bit small. Goodness it took me for.eva!